What do you call someone who stands on the side of a highway and blasts pepper spray at a group of passing bikers? Around these parts, you call him a police officer. One of the bikers posted a video on Facebook showing the officer spraying him and his friends as they roared by. The Fort Worth Police Department told local news media that an internal investigation into the incident is underway. The officer was making a traffic stop and was parked on the side of the road. Perhaps the bikers drove too close to the officer. A Weekly reporter was ticketed a few years ago for not moving to an inside lane when passing a police officer parked on the side of the road during a traffic stop. The video shows that some of the bikers didn’t move into the inside lane. Perhaps that made the cop angry and prompted him to spray them. If the spray had worked correctly, it should have rendered some of the bikers unable to see while driving. Some of the bikers complained about burning skin after passing through the pepper spray, but nobody wrecked out. In the future, maybe police officers should take a cue from Clint. 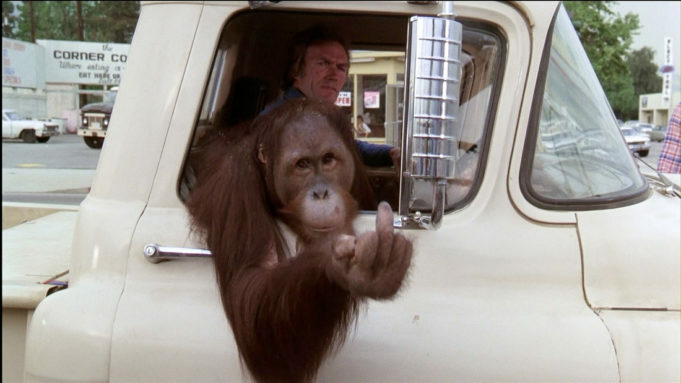 Remember in Every Which Way But Loose when Clint Eastwood says, “Right turn, Clyde,” and his orangutan punches that biker? And when the biker falls, he takes out a whole line of other bikers? FWPD could refer to this as the Right Turn Clyde maneuver. That should teach those bikers to be more responsible for their actions. In a recent Metropolis story (“420 Law,” Feb. 10, 2016), Weekly associate editor Jeff Prince described how Fort Worth attorney Casey J. Cole offered to represent 420 first-time marijuana offenders for free in Tarrant County courts. His reason? Just to let state officials know that Texas marijuana laws are draconian. Getting popped for a personal stash of weed in Tarrant County can lead to jail time and thousands of dollars in fines, fees, and attorney costs, not to mention having a class B misdemeanor on your record. The first lucky unlucky person to sign up for Cole’s free representation was a 21-year-old Mansfield resident. Tyler was busted for a small amount of marijuana earlier this year. Possession of fewer than two ounces of marijuana is a Class B misdemeanor, with punishment ranging from up to 180 days in jail to a $2,000 fine. A conviction can stay on a person’s permanent record and can also result in a suspended driver’s license and the possibility of community supervision or probation. Tyler said Cole’s representation helped him get signed up for a deferred adjudication program in which his criminal record will be expunged after four months. He had to fork over $200 for that program, and he expects to pay $400 or more in court fees. But he saved about $1,500 in attorney fees, he said. “It’s a good second chance for me to fix a personal mistake I made, so I won’t have it on my background the rest of my life,” he said. At first Tyler said it was OK to use his name for this article. We mentioned that it seemed counterintuitive to work so hard and pay good money to qualify for deferred adjudication to clear your record and then to give your full name for the Google gods to forever remember. Tyler also sounded very, very relaxed despite it being in the middle of the afternoon on a Tuesday. We asked whether he’d learned any lessons from his arrest. “If it’s against the law, don’t do it,” he said. So, have you given up the ganja for good?